Born Finali, Sicily, June 23, 1893. Killed New York, NY, May 9, 1922. Silvio Tagliagambe was part of the Brooklyn- and Bronx-based Salvatore D'Aquila Crime Family as it unwisely attempted to take control of rackets in Manhattan. Tagliagambe lost his life in the war between D'Aquila and Giuseppe "Joe the Boss" Masseria. Born in the Sicilian coastal village of Finali in the eastern reaches of Palermo province, Tagliagambe came to the United States as a youth, arriving in 1906-1907. His early residence in the U.S. was in the Williamsburg section of Brooklyn, home to an "old-school" Mafia faction transplanted from the area of Castellammare del Golfo, Sicily. During his short life, he was linked with a conservative Mafia faction. In 1913-1914, the Jimmy Curley Gang feuded with a rising Manhattan racketeer named Antonio Celentano. Evidence of the feud first reached the newspapers when Celentano was taken into custody for the July 16, 1913, fatal shooting of Joseph Donato of 57 Kenmare Street. A police officer from the Mulbery Street Station witnessed part of the gunfight between Celentano and Donato in a saloon near the corner of Kenmare and Mott Streets. The officer arrested Celentano, who was found to be unarmed. The officer indicated that another unseen gunman also was involved. Donato died at St. Vincent's Hospital of a bullet wound to the forehead. Seven members of the Curley Gang struck back just after midnight on February 12, 1914. Celentano was having a late supper with his wife at the Tivoli Restaurant, 341 Broome Street. Eight or nine other diners were also inside the small establishment. At about twelve-thirty, the seven gangsters entered quietly, one at a time, and positioned themselves along the restaurant walls. The seven drew firearms, as one pointed out Celentano. Gangster Antonio Santini approached Celentano, moved his handgun from his right to left hand and drew a knife with his right. Celentano responded by standing with his hands raised. 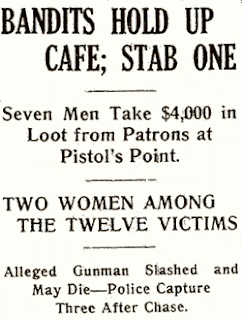 The remaining gangsters proceeded to rob everyone in the establishment, including proprietor Raymond Perrette, of cash and jewelry. A diamond ring valued at $500 was taken from Mrs. Celentano. When that was finished, Santini stabbed Celentano repeatedly in the side and abdomen. Celentano fell to the floor, bleeding badly. The gangsters fled. Screams from the restaurant alerted three nearby police officers, who gave chase. The gangsters took off in different directions, some were observed tossing away handguns. The police managed to catch up with three of them: Antonio Santini, twenty, of 348 East Thirteenth Street in Manhattan; Leo Belanca, twenty, of 504 East Thirteenth Street; and Tagliagambe, then a resident of 741 Park Avenue in Brooklyn. Tagliagambe was the only one of the three found to be in possession of a revolver. Records indicate that Santini and Belanca were convicted of second degree robbery in Manhattan General Sessions Court and sentenced to serve five and a half to seven and a half years in Sing Sing. There is no such record for Tagliagambe, suggesting that he avoided serious penalty for his involvement in the Tivoli Restaurant incident. It seems likely that the Jimmy Curley Gang was affiliated with a Mafia organization in New York City. Tagliagambe, as the only known member from outside the East Village, may have served as a link between the gang and Brooklyn Mafia bosses. Such a position would have provided him with help in avoiding prosecution/conviction. Other members of the gang were not as fortunate. Police tracked down Joseph "Orlando" Lopanto and Joseph "Little Mike" Perillo, and they were charged with participating in the Tivoli holdup. Jimmy Curley, himself, did not last long after the attack against Celentano. On March 3, 1914, following a visit to his ailing mother at 200 First Avenue, the twenty-two-year-old gang leader was fatally shot in the abdomen. The shooting occurred on Twelfth Street between First Avenue and Avenue A. Three men, residents of Thirteenth and Fourteenth Street, were close when the shooting occurred and helped Carioggi into a nearby store. The Rev. Francis Edwards of Grace Chapel heard the gunshots and called for police. Investigators rounded up known members of the Curley Gang and also questioned Antonio Celentano, still recovering at St. Vincent's. "I don't know anything about it," Celentano insisted. Tagliagambe married Francesca Vecchione in Manhattan in December of 1916. When he registered for the World War I draft the following year, he and Francesca were still living at the Park Avenue, Brooklyn, address, and he reported that he was employed as a cigarette maker in Manhattan. By the time of the 1920 U.S. Census, Tagliagambe, his wife and their son were living on Manhattan's Fourth Street in the East Village, about a half mile from the Ninth Street home of top D'Aquila enforcer Umberto Valente. Salvatore "Toto" D'Aquila became the boss of bosses of the American Mafia around 1912, following the incarcerations of Mafia leaders Giuseppe Morello, the previous boss of bosses, and Ignazio Lupo on counterfeiting convictions. D'Aquila was insecure on his underworld throne. He sought to dominate the Mafia organizations previously loyal to Morello and Lupo and had Umberto Valente murder East Harlem Mafia leader Fortunato "Charles" Lomonte in 1914 in an effort to control that region. Developments during 1920 worsened D'Aquila's insecurity. In March, Morello was granted an early release from prison. Lupo was surprisingly paroled a few months later. To prevent Morello from moving to regain his position, D'Aquila initiated a quarrel with Morello loyalists and passed death sentences against Morello, Lupo and ten other men. Inexplicably, D'Aquila included his own enforcer, Valente, in the sentence. The Morello group went into hiding, some returning for a time to Sicily. Over time, D'Aquila found himself facing opposition from a new source in lower Manhattan, a gang loyal to Giuseppe Masseria. D'Aquila patched things up with Valente and sent him to eliminate Masseria. A series of shootings resulted. Early on May 8, 1922, Morello's half-brother Vincent Terranova was shot to death at 116th Street and Second Avenue. Later on that same day, gunshots were exchanged between Mafiosi near Grand and Mulberry Streets in lower Manhattan. Bystanders on the crowded sidewalks were wounded. Police captured Masseria as he was fleeing the scene. That night, Tagliagambe was brought by ambulance to Bellevue Hospital. He had serious bullet wounds received sometime earlier in the day. Though Tagliagambe would not answer police questions, it was determined that he was part of the gunfight at Grand and Mulberry. Tagliagambe succumbed to his wounds the next day. Upon Tagliagambe's death, Masseria was charged with homicide. He was free on $15,000 bail three months later when Valente made an unsuccessful attempt on his life. The war in lower Manhattan was effectively won by the Masseria faction just a few days later, when Valente was murdered at Twelfth Street and Second Avenue. Masseria's position as top Mafioso in Prohibition Era Manhattan dramatically increased his wealth and influence. D'Aquila retained his boss of bosses title until his murder in 1928. Silvio Tagliagambe's widow Frances and their son moved in with her sister Agostina and brother-in-law Louis Manzella in Brooklyn. "Bandits hold up cafe; stab one," New York Tribune, Feb. 12, 1914, p. 1. "Bandits shoot down eight on East Side," New York Daily News, Aug. 9, 1922, p. 2. 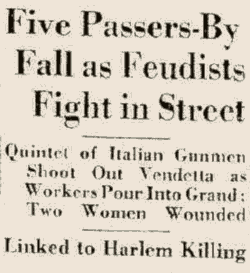 "Five passers-by fall as feudists fight in street," New York Tribune, May 9, 1922, p. 1. "Man slain, two bystanders shot in bootleg feud," New York Daily News, Aug. 12, 1922, p. 2. "Policy kings taken in bomb squad raid," New York Sun, Feb. 12, 1917, p. 4. "Silvio Tagliagambe," World War I Draft Registration Card, June 5, 1917. Certificate and Record of Marriage #19426, City of New York Department of Health, July 27, 1914. Gentile, Nick, Vita di Capomafia, Rome: Crescenzi Allendorf Editori, 1993, Chapter IV. Manifest of the S.S. Presidente Wilson, arrived NYC on Jan. 18, 1922. New York City Extracted Death Index, certificate no. 13878, May 9, 1922. New York City Extracted Marriage Index, certificate no. 1093, Dec. 30, 1916. Sing Sing Prison Admission Register, no. 64350, no. 64351, March 18, 1914. United States Census of 1920, New York State, New York County, Ward 8, Enumeration District 623. United States Census of 1930, New York State, Kings County, Brooklyn, Canarsie, Assembly District 2, Enumeration District 24-1247.